By stayhomecupcake on October 17th, 2011 . Filed under: Cupcake Ideas, Decorating, Giveaways, Kids . It is a small cake in a cup with toppings and icing usually . A CUPCAKE IS YUMMY FAMILY TIME!!!! A cupcake is a small indulgence you can allow yourself without feeling too guilty! A cupcake is a small cake.. where everyone enjoys the same size cake with frosting & decorations… no one has to fight for the “flower” or “letter” like on a big sheet cake. i HEART cupcakes!!! Cupcakes are delicious bits of heaven. They make me happy. A cupcake is a delicious little cake!!! Cupcakes are pure happiness in a paper wrapper! They make everyone smile! Cupcakes are happiness defined! Just seeing them cheers me up and makes me smile. Cupcakes are a sweet treat that can easily turn any frown upside down!! Cupcakes are the sweetest eye candy treat you love to eat! that can go for a person you love also! A cupcake is to me is my own little get away….I can forget about the worries of the day and just enjoy my cupcake. Cupcakes are a smaller portion of something you’d love to eat all of. 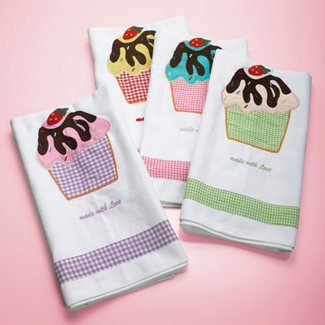 They indulge the sweet tooth while reducing the guilt…all while being cute& fun as heck! To me a cupcake is (literally) a single serving of cake. But thats not all cupcakes mean, I’m a baking and pastry student and cupcakes are my life. My goal in life it to own a Cupcakerie, my spare time is put into these cute, little snacks. A cupcake can make someone’s day turn all around with that first bite and that happiness is spread. Cupcakes just make the world a better place! Cupcakes are mini cakes of awesome! I have always had a love for the delicious confections, whether it’s making them, eating them, or buying anything with a cupcake on it ;D Cupcakes remind of family, my sister and I are always making cupcakes whether its for a birthday, celebrating a holiday or satisfying our sweet tooth ;D. It’s something that is near and dear to my heart because of the close bond it brings me to my sister and I love spending time with her. Cupcakes to me is not just something that you eat., To me they are fun cute and puts smiles on everyones faces. They cheer you up when your down! When you give someone a cupcake it puts alittle smile on their face. I watch people all the time when they eat a cupcake. The joy it brings them. It’s not like a cake where you have to take a fork and then eat the piece. A cupcake you just pick it up with your hand, or pop it in your month and love every second of it! cupcakes are bites of fun individually wrapped! Cupcakes are pure happiness. It’s a little piece of heaven in your mouth. When you eat a cupcake you can’t help but smile! Cupcakes are the perfect serving of perfection! While most mothers buy disney princesses for their girls, I love anything and everything cupcake. A cupcake is a little piece of heaven that puts a smile on everyone’s face! A cupcake is an edible smile…a stress remover…a morsel of youth and nostalgia. Cupcakes, like kittens and puppies, can and will always put a smile on anyone’s face. A cupcake is my baby girl, we called her cupcake before she was born (before she hada name ) and she has cupcake everything now :-)… We still call her cupcake too! Cupcakes are a tiny sprinkle from heaven. They represent the pot at the end of the rainbow, a child’s laughter, a cute puppy or kitten, that A+ on your report card, the glint in someones eye, the butterflies in your belly when you know you are in love. Cupcakes are making people smile one Cupcake at a time! I absolutely love cupcakes! I love to bake them, eat them, share them. They are the means to making people (& their bellies) happy! Cupcakes are an indulgent treat that can be made in a million ways to suit anyone’s taste, be it sweet, savory or somewhere in between, and decorated to fit any mood or celebration..or just because! A cupcake is my sweet little reward when i’ve done a tonne of good work or a little pick me up when I can’t get any work done!! Cupcakes mean happiness and love, in three small bites :) Cupcakes mean someone cares that you’re a nurse working a 12 hour shift with no break. A cupcake is a special small cake that as your taking bite of it, it makes you feel like a kid again. You enjoy each bite of it even though it’s done with in 3 bites…yummy!!! It is a distinct prize for someone special. Someone took the time to precisely fill a small space and frost the top with time and effort. It has the perfect amount of space between top and bottom with a bit of cake and a bit of frosting in every bite to bring joy in your mouth and heart. My four yr old came up to me and said, ‘Mummy, you smell like love’, I asked him, ‘well what does love smell like’, like cupcakes and flowers silly….. Cupcakes = love…..
Grandmother’s treat when I visit her. A memory full of sweet imagination. An angelic whimsical journey through sugar. An icing smile towards the one you love. This dispenser is adorable! I love her shop! For me, a cupcake is something fluffy and yummy, a sweetiepie, something beyond cute! A cupcake is small piece cake frosted with a delightful frosting when you bite into it you melt into cupcake land. cupcakes are little sweet moments, they can be classy or fun, simple or extravagant. i love them! Wow. Cupcake to me has been a sense of freedom. I have gone through many very difficult life changes this year. And baking has become an experience of healing and passion. I discovered something new that I am pretty good at! Making delicious cupcakes that make me happy, bring joy to others, and bring income for my family! I love cupcakes! It’s something that makes others happy, and therefore makes me happy too! I have a small cupcake business and I SO enjoy making someone smile just because of some simple flour, sugar and eggs. My favorite customers are the kids who are thrilled at the simple pleasure of picking out what sprinkles they want on top. It makes my day! A cupcake to me is about memories. Making them, eating them, or buying them and sharing them with your best friends. Those moments are made sweeter when you have cupcakes involved. Every one is unique and special just like the people you share them with. Cupcakes, to me, are a clever way to enjoy something delicious and sweet without having to share…I mean, how could you possibly break a cupcake in half, or have someone bite into your cupcake? I think these “little cakes’ are heaven-sent! A cupcake to me is not just a sweet treat its a life quote!!!! i think of cupcakes everyday as a fun, beautiful happy life!!!!! just looking at a cupcake makes you happy n its a simple way to enjoy the little things in life!!! my grandma was diagnosed with breast cancer and she cheers up when i bake her cupcakes!! i feel its a way to take her pain away if only for a moment!!! we share that joyous moment with my cupcakes!!! Decorating cupcakes bring me a sense of relaxation and joy. I find each one to be a piece of art that I create. Generally made for someone special in mind and I decorate according to how I am inspired by them or a quality about them that I can bring to life on/within a cupcake. The happiness the finished product brings to someone else is the most rewarding. A cupcake to me is a symbol of youth and fun, I think when we get so bogged down by the worries of the day, a beautifully decorated and tasting cupcake is just what we need to brighten our moods and get on with life. Sometimes the best things in life are simple and delicious! A cupcake is a beautifully crafted mini cake full of love and warmth. The perfect way to brighten up any and every day! I have a niece, Sarah. I love her to pieces. Growing up I use to call her my sugar cookie because she is so sweet. But, as she has grown I started calling her my cupcake. She asked me one day why now “cupcake”? I told her now that she is getting older(now 12) she’s a bigger, sweeter, lovelier treat to be around. She’s my special little cupcake, and always makes my day. A cupcake is the most wonderfully delicious treat ever created!! A cupcake to me has a deep meaning to me. I like how each cupcake can be different and look unique but they are accepted for what they are. I just like that they can be different. A cupcake is a recipe to happiness. Move over frostys! To me it’s impossible for you NOT to smile while eating a Cupcake. Cupcakes are a little bit of heaven! Cupcakes are a little piece of heaven in a wrapper. Cupcakes represent the art of baking in the cutest form. They are sweet, portable and the perfect size for indulging and never feeling guilty about it. They let you have that moment of cake but on a much more personal level. Cupcakes are just enough….when you really just want to eat the whole cake!!!! I seriously am in love with this…. too sweet!!! Cupcakes make everyone happy no matter the age! A cupcake for me represents a dozen ways to get something right, When you bake a cake the whole thing is on the line. If I mess one cupcake up I have 11 more tries to get it the way I want. A cupcake for me represents many opportunities!!! I’m a cupcake! At least, that’s what my dad called me when I was little! LOL! Cupcakes are many things. Sugary sweets, yummy memories, fond hellos. My husband’s nickname for me is cupcake, so every time i hear the word i smile, especially when it comes from him. Cupcake is usually my online handle as well. And you just cant beat the smell of fresh cupcakes in the oven! Cupcakes are individual pieces of heaven. 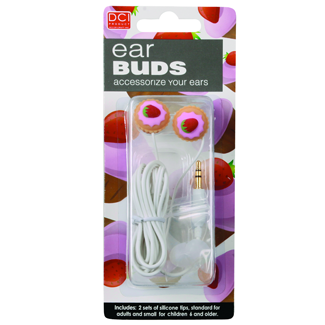 They come in different flavors, colors, and sizes and but are always just the right size for you. They put a smile on your face, on your taste buds, and in your stomach! A cupcake is a sweet morsel of goodness with frosting!! A day without cupcakes is like a day without sunshine…..
A cupcake is a delicious, moist, gourmet taste of yummyness and an indulgence to share with a friend. It’s an opportunity to sample new and fun flavor combinations! Cupcakes are also a little bit of an obsession since I have painted one and have a cupcake necklace. Cupcakes are something that get me in a good mood! That is why my kitchen is going to be decorated in them : ) They mean family time to me because my 2 and 5 year olds always make them together as mommy daughter time. to me, cupcake is the way i earn extra money to do fun stuff with my kids! A cupcake is a delivery system for buttercream! Cupcakes are paper wrappers filled with happiness in the guise of petite cakey goodness. Well the #1 thing that comes to my mind is my daughter, I call her my little cupcake! Cupcakes are all things, cute, sweet & happiness to me! Cupcakes are sugary awesomeness in a wrapper. They make life sweeter. a cupcake is a reminder that everything is better when there is something sweet on top. its kind of like my own glass is half full, not empty. A cupcake is a clean slate for my daughter to go crazy decorating! No two are ever the same! A cupcake to me is a happy memory. Now I didn’t always think that about cupcakes. As a matter of fact it wasn’t until last year that I thought this way about cupcakes. Last year I had a friend who while here loved to bake both cupcakes and in general, Sadly she passed away. To honor her memory many of her friends and family got cupcake tattoos (allthingscupcake even did a article on her story) in her memory. Whenever I see a cupcake I think of her and it brings a happy memory. A cupcake can make anyone smile, and thats what makes them wonderful! Cupcake: another example that good things come in small packages! Cupcakes are my freedom! No matter how they look, what crazy idea I have for them, I’m free to do what ever comes to mind and know they will still be delicious! A cupcake is a petite gateau…..enough said! 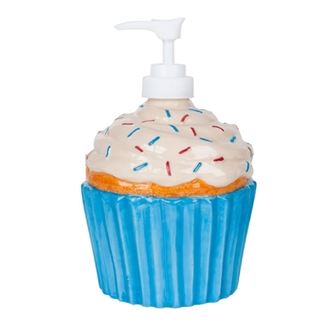 haha that is an awesome soap dispenser i think i need some of those for my website! theys nothing like the smlie on my grandsons face. when he enjoys a cup cake..because his love for cupcakes…im redoing my kichen in all cupcakes,,thank you ….